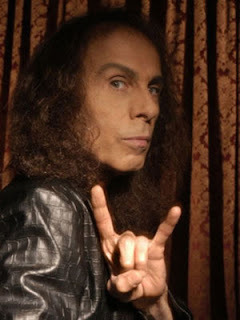 Although not geek related, we here at allroundgeek thought that we should take a moment to write a few words for Ronnie James Dio, who passed away on Sunday 16th May, 2010 after a 7 month battle with stomach cancer. Although small in stature, he certainly wasn't lacking in character and over the decades he has contributed huge amounts of quality to Heavy Metal and many of it's sub-genres. Even after being diagnosed with cancer he was determined to get well and back touring as soon as possible, but unfortunately it was not to be. I invite the gang to write their own messages in the comments section. Ronnie James Dio was not only a giant of the rock and metal scene of the past 4 decades but he was also one of the nicest guys around. A true artist who sincerely loved the music and moved rock and metal forward. We will miss you Ronnie... Thank you for the great company you've kept us all these years..